for information security and privacy. 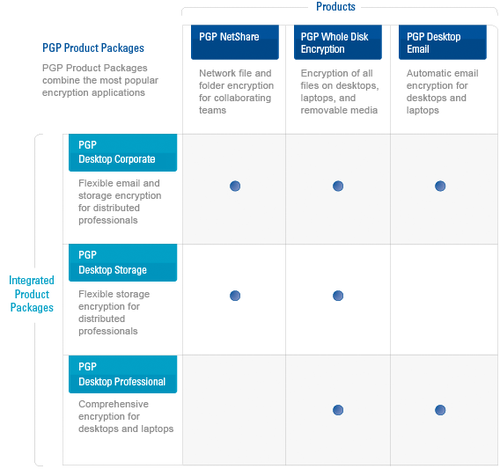 PGP Desktop Corporate provides flexible, multi-layered encryption using PGP® Desktop Email and PGP® Whole Disk Encryption to secure confidential data in email and in files stored on local desktop or laptop systems and using PGP® NetShare to securely share files with selected colleagues. This approach ensures that only authorized users can access sensitive data, fulfilling partner and regulatory requirements for information partitioning and security. PGP Desktop Storage provides flexible, multilayered encryption using PGP® Whole Disk Encryption to protect confidential files stored on local desktop or laptop systems and using PGP® NetShare to securely share files with selected colleagues. This approach ensures that only authorized users can access sensitive data, fulfilling partner and regulatory requirements for information partitioning and security. A PGP Perpetual License with PGP Maintenance entitles the customer to use the designated PGP software indefinitely, plus receive all Upgrades and Updates to the licensed software during the valid PGP Maintenance period; PGP Maintenance must be renewed annually. One year of Basic Maintenance is included with the purchase of a PGP Perpetual License. Currently, the annual cost of renewing PGP Basic Maintenance is approximately 18-25% of the Perpetual License cost. A PGP Subscription License entitles the customer to use the designated PGP software during the subscription period designated on the order, typically 1 year. Customers choosing Subscription Licenses receive the current version of PGP software and all Upgrades and Updates to the licensed software during the subscription period. PGP Corporation is pleased to announce significant upgrades to the award-winning PGP® Encryption Platform, along with general availability of PGP® NetShare 9.9, PGP Universal™ Server 2.9, PGP® Whole Disk Encryption 9.9, and introducing all-new PGP® Whole Disk Encryption for Mac OS X. Only PGP® solutions provide a complete, policy-based encryption solution to protect data throughout its lifecycle, at rest and in transit. This software release represents nearly a year’s effort, reflecting customer feedback to meet encryption needs even better than before. New to the PGP Encryption Platform is PGP Whole Disk Encryption 9.9 for Mac OS X. It extends PGP Corporation data encryption technology to Intel-based Mac OS X systems with pre-boot authentication. PGP Whole Disk Encryption is the only product available today for both Windows and Mac OS X that is FIPS 140-2 validated for use by the U.S. government. For product release notes, please visit https://support.pgp.com/?faq=589.